This chapter will focus on anaplastic thyroid carcinoma (ATC), thyroid lymphoma, and metastases to the thyroid gland from non-thyroid cancers. Although these entities represent three uncommon clinical scenarios, thyroid physicians should be knowledgeable on how to manage each. ATC is a highly lethal disease with survival usually measured in months. Management should be focused on diagnosis, appropriate counseling, and supportive care, and when possible, clinical trial enrollment. Thyroid lymphoma, most commonly diffuse large B-cell lymphoma (DLBCL), is not typically treated with thyroidectomy, but patients often present to the surgeon for initial management and biopsy. 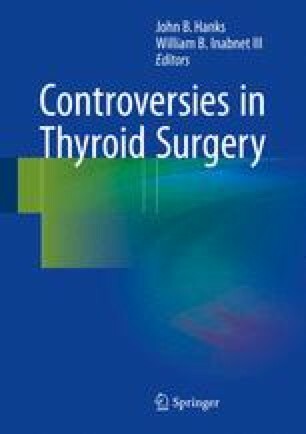 Lastly, metastatic disease that has spread to the thyroid gland has a number of important considerations, most notably that patients undergoing thyroid metastasectomy should be highly selected and offered resection only after multidisciplinary evaluation.